This gallery features the 7 shaman crowns or head dresses and 8 ceremonial shaman aprons I recently completed as part of the installation for my show, “Shaman Johnny’s Pop-Up Shop & Gallery”, at Work Gallery in Ann Arbor, Michigan from March 11-April 2, 2014. The crowns are all made on a cone base or what I call “the cone of power.” A hat and crown shape that can be found in many permutations across the world including witches, wizards, clowns, shamans, the dunce, the Spanish penitent, and the Medieval hennin. Each of the 7 crowns has some form of a veil to cover the wearer’s eyes. The veils are inspired by the adenlas, or crowns, that Yoruban kings and shamans wear. The veil is used to protect others from the strength and power of the shaman’s gaze. The seven crowns are made on buckram and wire frames and covered in brightly colored raw silks. Each is decorated with found objects including dolls and doll parts, dice, dominoes, paper gum chain, ball fringe, millinery butterflies, Christmas decorations, pop bottle caps, vintage costume jewelry, ribbons, clock faces, surveyors fabric tape measure, compasses, mah jong tiles, buttons, wood propeller, bingo numbers, a super ball, an anatomical eye and more. 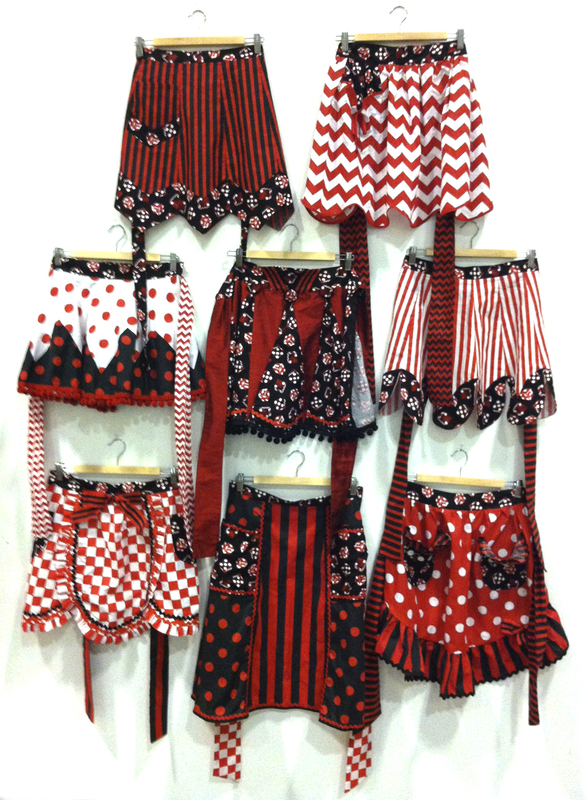 The eight ceremonial aprons are made from my collection of home sewing patterns from the 1930’s through the 1960’s. Aprons are one of the most ancient garments and were used in religious rites from ancient Egypt to China to Central America to Scotland. In the bible, Adam and Eve cover their naked bodies with aprons made of fig leaves that are meant to represent the loss of innocence and the gaining of knowledge. Examples of ancient gods wearing aprons can be found all over the world. Beyond their modern utilitarian uses, aprons are still worn today by Free Masons, Odd Fellows, Mormons, Scots, the Pope, and Sumo wrestlers in ceremonies and rites. Crown of Direction, Time, & Measure (2014) 36" x 10" x 10"
Crown of Insight (2014) 45" x 12" x 12"
Crown of Blessings (2014) 52" x 10" x 10"
Crown of Transformation (2014) 32" x 11" x 11"
Crown of Duality (2014) 34" x 10" x 10"
Crown of Good Fortune (2014) 19" x 10" x 10"
Crown of the Heavens (2014) 30" x 10" x 10"